The Lawrence Herbert School of Communication presents its second symposium this academic year examining the use and evolution of virtual reality in journalism and nonfiction storytelling with some of today’s top developers, editors and filmmakers. The one-day conference, “Immersive Media and Nonfiction Storytelling,” will be held on Tuesday, April 12, 2016 from 12:45-6 pm in Herbert Hall Studio A (Room 114). “In Fall 2015 we had invited interactive documentary creators to talk about the web as a seamless environment for text, film, and audio,” said Aashish Kumar, associate professor in the Department of Radio, Television, Film. “This is part two of our Immersive Media series, with a focus on virtual reality technology and how it is being used in fields as diverse as journalism and documentary, in addition to gaming.” Professor Kumar is co-chair of the symposium, along with Russell Chun, assistant professor in the Department of Journalism, Media Studies and Public Relations. 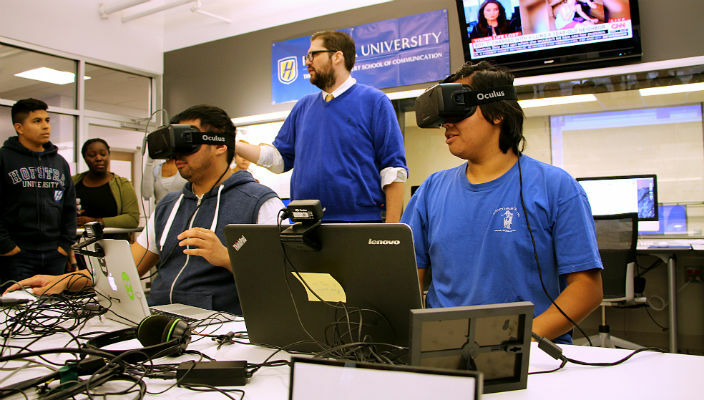 During the day’s events, students and faculty can explore and interact with the latest virtual reality technology being used by organizations such as the Associated Press, PBS, The New York Times, YouTube, and Facebook. Panelists who will be on hand to discuss new directorial approaches, ethics, and the practices and technical challenges involved in teaching and creating VR content include Dan Archer, founder of Empathetic Media; Frontline’s series coordinating producer Carla Borrás and director Marcelle Hopkins; Deniz Ergürel, founder of journy360.com and haptic.al; Nathan Griffiths, interactive editor for the Associated Press; Armando Kirwin, director of VRSE Works; and James Pallot, co-founder of Emblematic Group. The event is free and open to the public, and is co-sponsored by the Hofstra Cultural Center, Faculty Computing Services, the Departments of Radio, Television, Film and Journalism, Media Studies, and Public Relations, the Documentary Filmmakers Club, and Continuing Education.